The existence of TypeCon speaks to the popularity of type – or fonts, as most people would put it – in the contemporary world. The conference arose from a nascent community of people who simply liked type, and wanted to talk about it. Nearly 400 people in Boston this summer celebrated that fascination and the way the profession of type designer has spread out into the world at large. In 1997, the very first TypeCon, with its rock-bottom price and informal style, drew a surprising number of independent type designers, and this focus on small business and love of type has persisted ever since. People in the typographic community think of TypeCon, and its sponsoring organisation, sota (the Society of Typographic Aficionados), which began as an amateur organisation, as the ‘little guy’, in contrast to ATypI (Association Typographique International), which came together in 1957 as a consortium of large type manufacturers. But, as the technological and economic context of type has changed, that distinction has largely evaporated. Linotype had a significant presence in Boston – a presence that begged all sorts of questions, since Monotype Imaging had acquired the company just the week before. Linotype and Monotype had been rivals for more than a century, but both had been through implosions and reorganisations in recent years, and were owned by larger companies. 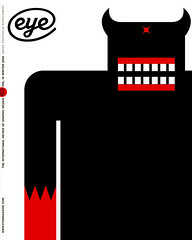 Since Monotype had been bought by Agfa some years ago, and Agfa had already incorporated Compugraphic, the upstart phototypesetting company of the 1970s, some people at TypeCon joked that the giants of hot-metal typesetting had finally been absorbed by the world of phototype – a couple of decades after phototypesetting became obsolete. One whole afternoon of the conference was devoted to ‘Dwigfest’, a celebration of the work of William Addison Dwiggins, who as a type designer in the 1930s and 1940s was a mainstay of creativity for Linotype. (See Eye no. 23 vol. 6.) Dwiggins was responsible for the workhorse book faces Caledonia and Electra (neither of which, alas, has been translated with complete success into digital form), and for a slew of experimental typefaces of various kinds. His inquiries into what made a typeface readable, and experiments in cutting shapes that gave a smooth impression when printed but consisted of sharp, unusual angles, anticipated the things designers such as Fred Smeijers have done in digital type in the past decade or so. Dwiggins was also famous as a book designer, working largely for Alfred A. Knopf; as a calligrapher and illustrator; as an author (his Layout in Advertising was hugely influential); and as a carver of marionettes. All of these aspects of his career were celebrated in turn at TypeCon. Dwiggins lived and worked most of his life in the Boston area, and TypeCon emphasised Boston’s typographic heritage. But there was nothing on the programme about those other famous men of Boston typography, Bruce Rogers and D. B. Updike, apart from allusions in the type quiz and side trips to the Boston Public Library. In a more contemporary vein, it would have made sense to feature the work of Matthew Carter and David Berlow; both spoke on the panel about ‘typography in publications’, and Berlow did a masterfully witty ramble as part of the opening ceremonies, but they were only a few speakers among many. The TypeCon programme was eclectic, and it was all done in a single track; no simultaneous talks in different rooms. The same morning saw Kit Hinrichs talking about the emotional content of type and a group of panellists ‘Demystifying Font Management in osx’. There was a good deal of focus on new technology, including typefaces for mobile phones and for Microsoft’s Xbox 360. Mark Jamra spoke intriguingly about his approach to teaching type, both on the main programme and at a forum on type and design education the day before. Megan O’Connell, who had just relocated to Portland, Maine, spoke about the creative letterpress community of Portland, Oregon. William Berkson presented his plans for creating a true revival of William Caslon’s types. Dave Farey and Mourad Boutros talked together about Arabic and Latin scripts. Cyrus Highsmith (see Eye no. 59 vol. 15) showed how his type-design work develops from ‘thousands of tiny drawings’. TypeCon’s other great bow to tradition, besides Dwigfest, was a tribute to Adrian Frutiger (see Eye no. 31 vol. 8), who is certainly among the best type designers of the twentieth century. The Society of Typographic Aficionados, which puts on TypeCon, gave Frutiger its 2006 sota award for his lifetime’s work. Frutiger’s health didn’t permit him to be present in Boston, so the award itself would be presented to him in Switzerland later in the summer, but at TypeCon a number of Frutiger’s friends and associates spoke movingly about the man and his designs. TypeCon usually ends with a final-night party at a remote location. This year it was at the Museum of Printing, in North Andover, Massachusetts, a 40-minute bus ride north of Boston. The museum is one of those astonishing hodgepodges of old stuff rescued from obscurity and presented all in one place. It smelled like an old machine shop -– a nostalgic aroma for the older typographers. Besides the earliest hot-metal typesetting machines and the original working drawings for most of the Linotype typefaces, the museum includes later outmoded technologies, including one of the bright-blue Compugraphic phototypesetters that I learned on in the late 1970s. Type technology has changed so much in such a short time that much of it is not so much history as living nostalgia. For many of us, it was a little like walking through an antique shop and spotting kitchen implements that used to be on our mothers’ shelves and kitchen counters.